Pink says body shamers have got it wrong if they think their opinion matters. Last month the pop star took to her Twitter account, posting a lengthy message slamming those who had criticised her weight. When ET asked her about the post, Pink explained why she decided to go public with her views. "I think people have gotten it wrong. They think their opinion matters and holds weight and I don't know where or why they're giving themselves so much credit you know?" Pink explained. "So I thought it was important for me to remind them that I don't care. My life is full, I like food a lot and I really like to cook, I like to live, I find joy in that and we're doing alright in the Hart household." 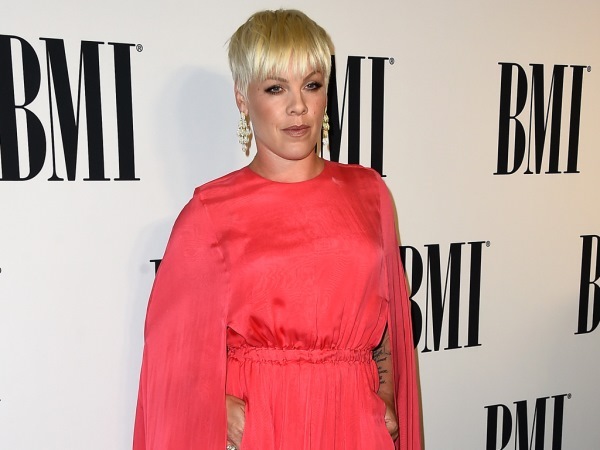 Pink, who has three-year-old daughter Willow with husband Carey Hart, rocked a floor-length fuchsia dress at last night's BMI Pop Music Awards. The gown featured a cape-like finish, which kept the singer covered up. The 35-year-old was honoured with the BMI President's Award and was joined by Carey, who looked dapper in a dark suit and matching shirt. "I don't take well to bullying. I never have. I'm not a person that will be bullied. I'm not a person that will stand by watching other people bullied. And I think I'm also raising a girl, I am a girl, I have feelings and people think I take no sh*t and I'm tough, tougher than nails, but I'm a human being," she sighed.